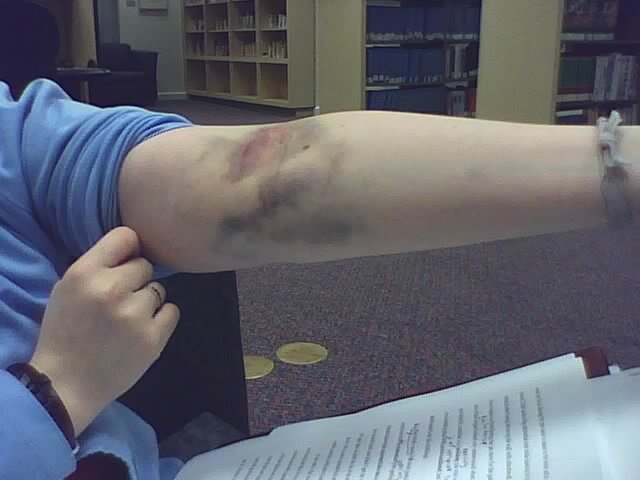 Remember That Donating Blood Thing I Mentioned? So I bruised a bit. This is what my arm looked like today. Yesterday, it was more strawberry flavored. Today, we’re looking at something closer to grape popsicles. I don’t usually have the option of having a pic, since I don’t have a camera, but today I happened to run into a friend of mine with a camera phone . . . but don’t worry; I didn’t hurt her (when I ran into her, that is). omg!! that sux. I had that happen too…hope they don’t reject your blood like they did me. Nothing stinks like going through all that for a good deed and they won’t accept it! OHDEARGOD! That looks horrid! Ouch! My C bruises terribly, and one time when he was about to hit a wall (literally) I grabbed him on the shoulders from behind. I didn’t grab him that hard, but there were fingerprint marks from my hands. I was soooooo worried his preschool teachers would call child protective services on me! I can’t believe you bruised so bad. They must have had a really hard time finding a vein. I don’t know if I wold donate again after that. Yikes!